Place chicken breasts in resealable food-storage plastic bag. In medium bowl, beat 1/2 cup of the broth, the oil, 2 tablespoons of the Dijon mustard, the lemon juice, garlic, salt and pepper with whisk. Pour over chicken; seal bag. Refrigerate at least 1 hour but no longer than 8 hours to marinate. Heat gas or charcoal grill. Remove chicken from marinade; pour marinade into 1-quart saucepan. Beat in remaining 1/2 cup broth and maple syrup with whisk. Place chicken on grill over medium heat. Cover grill; cook 8 to 12 minutes, turning once, until juice of chicken is clear when center of thickest part is cut (165°F). Meanwhile, heat sauce to boiling and cook 10 minutes, stirring frequently. Sauce should be smooth and slightly syrupy. Remove from heat; stir in remaining 1 tablespoon Dijon mustard. 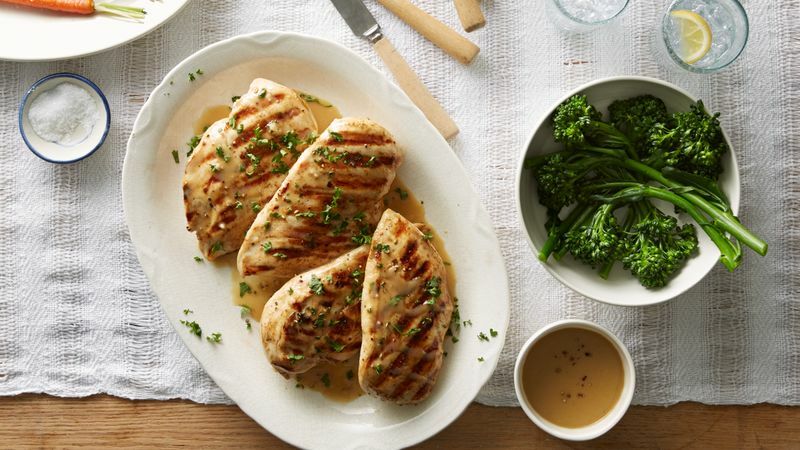 Serve chicken breasts with sauce; top with parsley. The marinade and sauce would work beautifully with pork chops as well. Real maple syrup gives the sauce a subtle sweetness, but honey could be substituted if desired.